Francisco Jose Ortiz Alvarez is an artist in Diriamba, Nicaragua. He specializes in folk art, depicting native Nicaraguan animals and characters on masks, wood and other materials. Francisco wasn’t always interested in art; in fact, he stumbled upon it. As a young adult, he worked in agriculture, then started a homemade candy shop with friends. However, this venture failed and he was left jobless. With time on his hands, Francisco happened to be roaming around a landfill and found some pieces of wood. He began to draw on the wood and asked his brother-in-law to paint in his drawing. He showed the painted wood to a friend, who loved it so much that he bought it for 130 córdobas (about $6 today). Francisco realized he could make a living creating and selling art. Soon, he began to purchase wood and sell his creations in his community. As he met other artists in the community, he decided that they should organize to sell their work together. He tried to get financing from the government but was turned down. In 2012, Francisco learned about FINCA’s loans and formed a group with his artist friends to receive a loan. The money has helped them put on exhibitions to sell their handicrafts. He was also able to rent a room for his studio. “FINCA trusted us and that was most important,” Francisco said. He has also taken out FINCA loans to start a bakery business with his brother, selling fresh baked goods by bicycle. 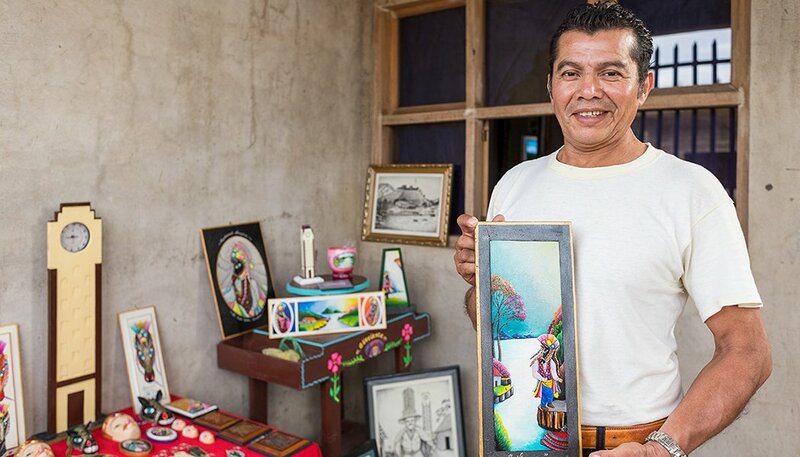 Francisco hopes that in the future he can open an exhibition center for handicrafters and artists in the city and a bakery storefront that he and his brother can operate.